Because networking evolved over severeal decades, many different cabling solutions have been used. But today, virtually all VDV copper cabling in the US has moved to unshielded twisted pair (UTP) as specified in the EIA/TIA 568 standard (ISO/IEC 11801 worldwide) because it has been inexpensive, may already be in place, is familiar to installers and is simple to install. (The cost and simplicity of installation has changed a bit, however, with Cat 5e/6/6A, see below.) Some users, mostly outside the US, use shielded twisted pair (STP) with shields over each pair in the cable or screened twisted pair (ScTP) with an overall shield around all the pairs. These cables can provide higher performance but require more care in installation. UTP cable has been a standard cable for telephone systems for almost a century, where it is generally used for analog phone systems (POTS or plain old telephone service.) These cables are generally large multipair cables with pair-count configurations of 25, 50, 100, 200 pairs or more. Most UTP cable used in structured cabling systems today is comprised of four pairs of carefully twisted pairs of solid copper wire, insulated with carefully chosen material to provide high bandwidth, low attenuation and crosstalk. Cables permanently installed in premises cabling systems use solid wire for higher performance but patchcords generally use stranded wire for greater flexibility and ruggedness when handled. UTP cable works so well because it is used with transmitters that work on "balanced transmission" as shown below. They transmit equal but opposite signals on each wire of the pair so each wire has only half the amplitude of the final signal. The electrical and magnetic fields of each wire are opposite and cancel out eachother, producing low electromagnetic emissions. Likewise, electromagnetic pickup is the same on both wires so they cancel out. The twists on the pair of wires mixes the emissions from the electrical signals so they cancel out. Twisted Pair Trivia: The two wires are referred to as "tip" and "ring" - but why? Does it have something to do with the ringer on a phone? No! It refers to the connection on a old phone plug from manual switchboards. The white/stripe wire was connected to the "tip" of the plug and the solid wire to the "ring" connector behind it! The secret ingredient of Cat 5e/6 is the twists of the pairs! Below, you can see the difference in the twists in each pair for different types of cables. From the left, we have telephone wire with hardly any twists in the pairs, then Category 3, Category 5e and Category 6 cables, with each higher grade having more tightly twisted pairs. The Cat 6 cable even has a separator between the pairs to reduce crosstalk at the higher frequencies where it will be used. The pairs are twisted tightly and very consistently, but each pair is twisted at a different rate to "tune" them to different frequencies to prevent crosstalk between the pairs. In order to maintain Cat 5e/6/6A performance, especially crosstalk, you absolutely must keep the twists as close as possible to the terminations- no more than 1/2 inch - 13 mm should be untwisted! UTP cable is terminated mostly in jacks, connector receptacles that have punchdown terminations on the backside and twists in the connectors inside to prevent crosstalk. See Terminations. Some snap into work area outlets, others are incorporated in rack mount patch panels. 568 allows many possible cable configurations, including intermediate punchdowns, but a direct run from a work area outlet to a patch panel will provide the highest performance, likely necessary if upgrades to fast networks like Gigabit Ethernet are contemplated. Patchcords for connecting network equipment to the outlet or patchpanel are usually purchased factory-assembled. The connector (plug) is properly called a "modular 8 pin connector" but usually is referred to as a RJ-45, which is actually a specific telco pin configuration on the same plug. They use stranded cable for flexibility and require special connectors. Order them to proper length if you can to prevent the mess that patch panels often become after a few moves and changes. Higher performance UTP cables were developed as computer network speeds increased and needed higher bandwidth cables. The first graded cable, Cat 3 was adequate for 10 Megabits/s Ethernet or 4 Mb/s Token Ring. Token ring at 16 Mb/s required higher performance cable, so Cat 4 was introduced, but neither network nor cable grade lasted long. Instead Cat 5 was introduced to support "Fast Ethernet" at 100 Mb/s. When Ethernet was upgraded to 1 gigabit per second (1000 Mb/s) , Cat 5 was upgraded to "enhanced" Cat 5 or Cat 5e. Cat 6 was developed by cable manufacturers as a higher performance cable with more headroom, but no network was ever specified to use it. Instead, when 10 Gb/s Ethernet was developed, an "augmented" Cat 6, Cat 6A, was required. TIA has recently approved a new shielded cable for short (30m) data center connections at 10-25Gb/s called Cat 8. 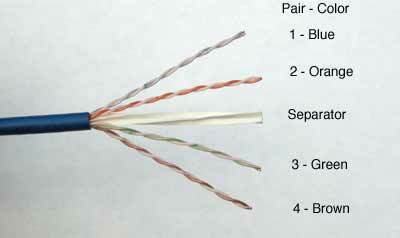 In Europe, a shielded twisted pair (STP) cable, Class F is used. Some US manufacturers offer a version of this cable they call "Cat 7" but TIA has not considered this cable part of TIA-568, so "Cat 7" is not its proper nomenclature. You can get hardware and cable rated for many different performance grades. With cable, it's easy to see the difference; it's in the twists - higher performance cables have more twists. But jacks are harder to tell the differences. But they are different - inside jacks rated Cat 5 or above you will find internal twists to reduce crosstalk. If you terminate Cat 5e cable with Cat 3 jacks, you will get Cat 3 performance - no better! When dealing with high performance UTP cabling like Category 5e, Cat 6 and Cat 6A designed to support Gigabit Ethernet or faster, termination procedures become even more complicated! It's vitally important to ensure all components are rated to the same high level in order to achieve that performance level. Here's a guide to the differences in the categories. Like everything else that deals with computers and communications, the speed of networks is going up. Cat 5e is OK to handle one gigabit networks, but the EIA/TIA TR 42 committee that writes the cabling standards (the same "568" we referred to earlier) approved the standard for Cat 6 cabling in June of 2002 after three years of debate, discussion and testing. Unfortunately, network speeds jumped to 10 Gigabits/second, requiring another redesign, leading to "augmented Cat 6" or Cat 6A. each new standard includes cables, plugs and jack, patch panels and patch cords, in other words, everything you need to install a complete cabling system. Performance specifications for Cat 6A are for significant advances over Cat 6 or Cat 5e - with attenuation and crosstalk performance higher at every level. So using higher rated cables give you more "headroom" - better signal to noise ratios - which can mean more robust data transmission on slower Fast Ethernet and Gigabit Ethernet (1000base-T) networks. Cat 6 was not associated with the requirements of any particular network, but many people installed it as a higher performance cable than Cat 5e. Gigabit Ethernet ran fine on Cat 5e (some manufacturers say it runs well on Cat 5 now) and when 10 Gigabit Ethernet came along, it could initially only run on fiber optics. The copper manufacturers developed an "augmented" Cat 6 specified for 10GbE. Cat 6A introduced a new performance issue, not within the cable itself, but in crosstalk with adjacent cables, called "alien" crosstalk. The power consumed by Cat 6A transceivers to send such high speed signals over copper was higher than fiber due to the signal processing needed for faster electrical connections. Fiber remains the most reliable solution for GbE and above. Years later, wireless access point providers, needing more than 1Gb/s speeds, developed 2.5 and 5G Ethernet electronics that would operate over Cat 5e cable, allowing wireless network updates over legacy cabling. These networks were later standardized by the Ethernet committee. This leap in technological advances, like all previous ones, comes with a cost. The goal of the committee is that each generation of Category-rated cable be "backward compatible" which means that any networking product that works on Cat 3, 5 or 5e is supposed to work on Cat 6. The other issue that the group wrestles with is "interoperability" - mixing and matching components. This part of the standard states that cable plant containing mixed categories (eg: Cat 5e patchcords on a Cat 6 cabling systems) is supposed to work without compatibility issues, but will only work at the level of the minimum component specification (Cat 5e in this case). Finally, there is the issue of compatibility among different manufacturers products. Practically everybody told users installing "pre-standard" Cat 6 to stick to one manufacturer's products or those tested for compatibility. The EIA/TIA press release on the Cat 6 standard stated: "To ensure generic cabling system performance, Category 6 component requirements are specified to be interoperable when products from different manufacturers are mated". The same issue probably exists with Cat 6A. The highest performance Category-rated cable is Category 8, ISO/IEC Class I and II depending on connector types used. Cat 8 is a shielded cable designed for networks in the 10-40G range, especially for use with short connections between servers and switches in data centers. It is limited to 30m length, adequate for typical data center top-of-rack or end-of-row architectures. Outside the US many countries, especially the Europeans, use Class F - a shielded 600 MHz cabling system, which the EIA/TIA TR42 committee has declined to consider such a standard in the US due to lack of interest from the network development committees. Internationally, ScTP and STP cable is much more common, as concerns over electromagnetic interference have affected standards more than in the US. ScTP cable is simply a UTP cable with a metallic foil shield over all 4 twisted pairs. Some manufacturers also call it FTP for foil-shielded twisted pair. The foil shield is for noise immunity, keeping outside noise out of the pairs and keeping emissions from the pairs themselves from escaping the cable. ScTP is not the same as shielded twisted pair which has a foil shield over each individual pair and may also have a shield over all the shielded pairs under the cable jacket. Current ScTP cables are smaller than most UTP cables that are rated as Cat 6A (augmented Category 6). The problems of crosstalk between pairs in two separate cables that affects Cat 6A, called alien crosstalk, is negated by the foil shield of ScTP. For UTP Cat 6A cables, the solution to alien crosstalk was bigger cables with thicker jackets, causing problems with the number of cables that could be accommodated in conduits and cable trays. ScTP Cat 6A cables are no larger than Cat 6 UTP cables, making them easier to fit in current cabling hardware. For termination, ScTP cables use shielded modular 8-pin connectors just like UTP but with a shield. Terminating the shield is pretty simple, just like adding a 9th wire to the cable. One does have to worry about grounding, as ScTP cable must be tied into the grounding busbar in the telecom room along with all the racks and other metallic hardware. The extra conductor in the cable offers another benefit. It can be used for cable management systems where it allows tracking cable connections using add-on electronic equipment that automates the most time consuming part of any cabling project – keeping documentation up to date. All cables installed inside buildings must meet flammability requirements of the building and electrical codes, which in the US means the NEC (National Electrical Code) or CEC in Canada. Communications cable will be rated per the following table, depending on its use. CATV cable (CATV) and multipurpose cable (MP) are also covered under other sections of the electrical codes. The performance of the cabling network is heavily dependent on the quality of the installation. The components used in structured cabling installation have been carefully designed and exhaustively tested to meet or esceed the requirements of EIA/TIA 568 for performance at 100 MHz. If the cable is not properly installed, performance will be degraded. In particular, one should avoid bending the cable too tightly, kinking it or using tightly installed cable ties which can crush the cables. Loosely bundling cables with "hook and loop" cable ties is much better. See installation for more tips. UTP Terminations, (Tutorial) UTP Termination.